Once he was a respected scientific genius, a powerful CEO and President of the United States. Then he was a pariah, a wanted criminal and Public Enemy Number One. 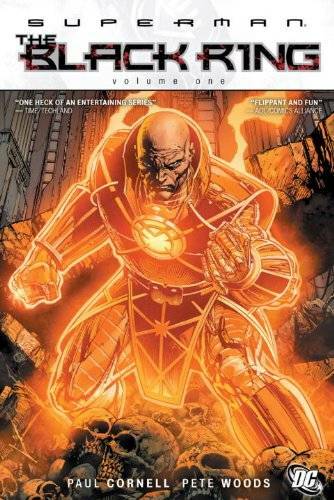 Now, having used his genius to save the Earth from alien invaders, thus earning himself a full pardon for his past crimes, Lex Luthor has regained control of the company he once built from nothing and reestablished himself as a power to be reckoned with in the world of legitimate business. It’s not enough because Lex Luthor was chosen to wield an Orange Lantern ring during the crisis that became known as The Blackest Night. Tapping into the unbridled avarice that dominated his heart, Lex Luthor briefly had access to the unlimited power he craved for so long. And now he wants it back. Accompanied by his loyal lackey Spalding and a life-like Lois Lane android, Lex Luthor will embark on an epic quest to reclaim the power that was taken from him. This adventure will pit Lex against other arch-villains, such as the parasitic alien caterpillar Mister Mind, the telepathic Gorilla Grodd and the immortal tyrant Vandal Savage. Lex will even confront Death herself and maybe, just maybe, finally find a way to make himself more powerful than Superman. It must have seemed like a mad idea when this story was first published as a series of monthly installments in the pages of Action Comics. Take away Superman’s main title for one year to devote a story to his greatest enemy and not even have the Big Blue Boy Scout show up until the very end? But mad ideas are the stock and trade of writer Paul Cornell, who had been delivering madness to the masses in his Doctor Who scripts and novels for quite some time before signing on with DC Comics. Cornell portrays Lex Luthor as a figure much like The Doctor – brilliant, witty, and at least three steps ahead of everyone else in the game. He also gives Lex a companion of sorts in the form of a Lois Lane FemBot who plays the perfect Devil’s Advocate when Luthor needs someone to stop him from crossing the line. Despite this surface similarity, The Black Ring is not a cleverly disguised Doctor Who script. Lex lacks the Doctor’s benevolent spirit and his tale is ultimately about an angry man seeking godhood rather than a lonely god affirming his humanity. Despite this heavy theme, there is much humor to be found in this series. Indeed, Gail Simone lends a hand to pen one of the middle chapters featuring her beloved Secret Six team, and the first volume features what has to be the funniest single page I’ve seen in any comic in recent memory. I won’t spoil the gag except to say that it involves combat spoons. You read that right. Combat. Spoons. All of this is ably illustrated by long-time Superman illustrator Pete Woods, whose work reminds me of long-time Justice League penciller Kevin Maguire. Crisp and clear, with an amazing array of expressions, all of the human characters in this series are clearly designed and crisply defined. Woods is also one of the few artists I’ve found who is capable of drawing gorillas that look both intelligent and savage at the same time.